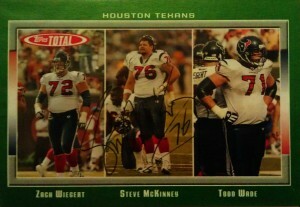 Seth McKinney was the Texans first free agent signee in the history of the franchise. The Texans had a very poor offensive line in those early years, and outside of Steve McKinney and Chester Pitts, the team could find no consistency from their other starters. From 2002-2006, Steve started every game at center for the franchise, but in 2007 suffered a torn ACL ending his season. With new head coach Gary Kubiak installing a ZBS system, he pulled the trigger on a trade to bring Chris Myers to Houston, effectively ending McKinney’s tenure in Houston. Originally an All-Big 12 selection from Texas A&M, Seth was drafted by the Indianapolis Colts in the 3rd round of the 1998 draft. An All-Rookie selection, Seth played guard most of his time in Indianapolis before joining Houston in 2002. After his time in Houston, McKinney played for the Miami Dolphins and Seattle Seahawks, retiring in 2009. A savvy businessman Seth has an eye for investments in the fast fast food industry. He was an investor with Freebirds Burritos, and owns a string of McDonalds restaurants.